Ao Dai is the traditional "dress" worn by Vietnamese women. This two-piece garment made of silk consists of a long flowing smock worn over baggy trousers reaching all the way to the ground. 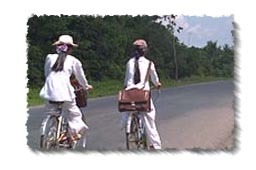 Teenage school girls trade in their blue and white uniforms for all white Ao Dai, and you'll often see them pedalling their bikes, with the smock of their Ao Dai draped over their handlebars. Older women wear Ao Dai of Various colors, often with intricate patterns and designs, in formal or work settings.